1.Line rimmed baking pan with parchment paper; line second rimmed baking pan with paper towel. 2.Prepare ravioli as label directs, cooking ravioli 2 minutes less than directed; drain. In large skillet, heat oil over medium heat 10 minutes (about 350°). 3.In wide, shallow dish, whisk flour, salt and pepper. In separate shallow dish, whisk eggs and water; place breadcrumbs in third shallow dish. Dredge ravioli in flour, shaking off excess, then dip in egg mixture and breadcrumbs to coat; place on parchment paper-lined pan. 4.In 2 batches, cook ravioli in hot oil 3 minutes or until golden brown, turning once; with slotted spoon, transfer to paper towel-lined pan. 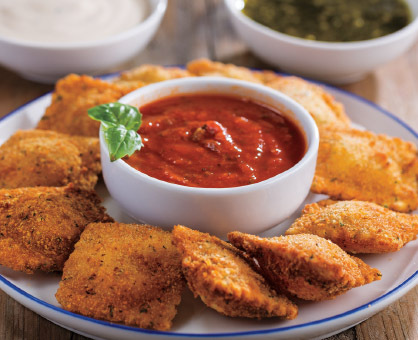 Serve with pizza sauce and Alfredo sauce and/or pesto, if desired.